Having been a working microbiologist for almost 40 years I knew that Helen and William Bynum’s talk about their book, “Remarkable Plants That Shaped Our World” would be too good to miss and I was not disappointed. They split the plants they discussed under different headings: Transformers, Taste, Healing & Medicines, Technology & Power, Cash Crops, Landscape, Revered & Adored and Wonders of Nature. While these categories had nothing to do with the accepted nomenclature of scientific biological classification they certainly worked as a way of looking at how plants have been utilized by humans over the centuries. More than half of the talk concentrated on the ways they have been used in medicines and how new medicinal properties were being developed from them in the modern day. It was a commendable presentation as both speakers expertly conveyed how important plants have been in developing our world. 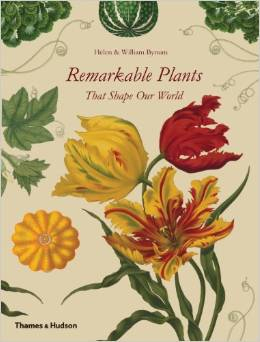 Remarkable Plants That Shaped Our World by Helen Bynum and William Bynum is published by Thames and Hudson Ltd and is available in hard cover and as an ebook. Those of you out there in cyberspace who have been following this blog may have noticed its absence in the last few weeks. This is because it and myself have been laid low by ailments. It is easy for me to understand how microbial infections have affected me. I contracted a virus, probably a cold, which lowered my natural immunity and led to a secondary bacterial invasion causing tonsillitis. Now with the aid of antibiotics I am well on the way to recovery. My blog posed a different problem. I was trying to load a “plug-in” which would have helped me monitor the stats when I was unable to access it anymore. Why this happened I do not know, neither does my service provider. The solution in the end was to kill it and begin again; much in the same way as you would put down an ailing pet animal and buy a new one. The new one will never be the same again but at least its lineage continues. I can still see “ghosts” of my old blogs out in cyberspace when I google them but can not longer see the whole articles. Fortunately I have them backed up in Word and may post them again in the future. But it might better to let them remain dead. It is ironic to note that on 27 May it was reported that the first human has been infected with a computer virus. Man and machine are truly becoming as one. You are currently browsing the archives for the Biology category.